Five Jewish youths are still being held on vague suspicions of involvement in the lethal Duma arson in July. No charges have been leveled, and it has been revealed that during the course of their detention without trial, they have been refused basic religious rights such as lighting Hanukkah candles, been banned from seeing their lawyers or family, and several have been denied medical treatment after being beaten during arrest. Honenu, the organization that is helping to provide legal aid for the detainees, told Arutz Sheva, that not only have the teens not been allowed to see their lawyers, but that it is unclear if they are being given proper medical attention, and the situation has dragged on for over three weeks. 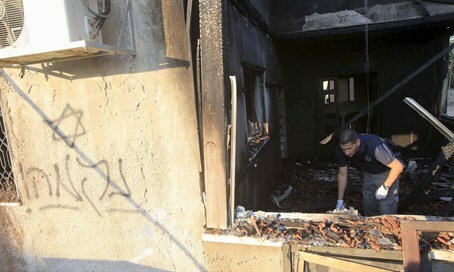 The Shin Bet internal security service is holding the teens, some of whom are minors, on suspicion of being involved in the arson at Duma. No formal charges have been laid and the detainees have not been allowed to talk to their families, lawyers, or even to visit the court. “We simply don’t know what is happening to them,” said Eran Schwartz spokesperson of Honenu. Schwartz explained that while originally there were six detainees, one was recently released. He also noted that one of the detainees is a US citizen. The family of the detainee, whose identity cannot be revealed, contacted the US Embassy in Israel to see if they could intervene on behalf of their child, and said that the US Consul was unaware of a US citizen being held by the Shin Bet. “He said that he would look into it” reported Schwartz. “We are talking about youths who are underage. There are a lot of laws being broken according to what we see by the Shin Bet. However, unfortunately the courts have thus far overlooked these illegalities, and have given a rubber stamp to the Shin Bet to do whatever they please, once they hear the word Duma” Schwartz said. The Shin Bet for their part has kept their cards close to their chest. They have not made formal accusations against the detainees nor have they pressed charges.